Christopher A. Joyce. Jr., 69, passed away on August 25, 2017 after a year-long battle with liver cancer. Born in Lynn, he was the son of the late Christopher A. Joyce, Sr. and Mary (Downing) Joyce. Chris leaves his sisters: Mary P. Joyce of Wakefield and Barbara Carlton and her husband, Richard of Lynn. He was the uncle of Kevin Carlton of Lynn and the late Christopher Carlton. He also leaves lifelong friends: Brian Mulvey, Mary Clutchey, and Marge Bartolo. Graduating from St. Mary's High School with the Class of 1966, Chris left for the U.S. Marine Corps. After his service time, he returned home and completed his Bachelors of Science degree from Boston State College, now known as UMass Boston. His career took many paths, from social work in the Boston area, where he met Brian Mulvey, to later assisting many as a financial advisor for Ameriprise and LPL Flagship Harbor. 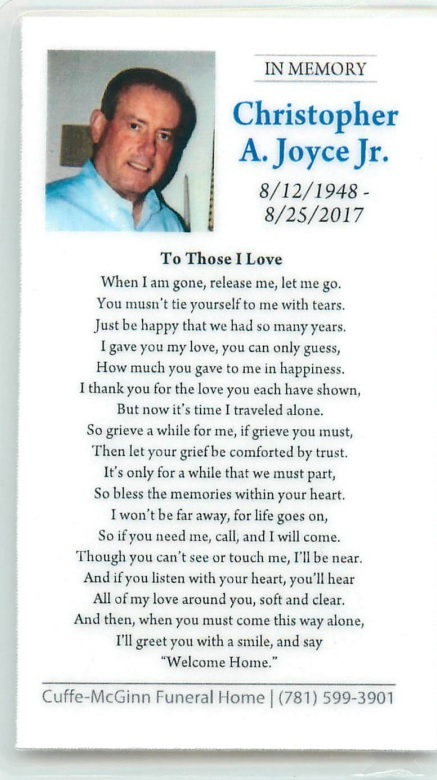 Chris made friends everywhere and maintained his relationships throughout his life, from St. Mary's classmates: Jimmy, Bobby, and Sandy, to his many clients and coworkers at Flagship and elsewhere. Friendships were of great value to Chris as well as his hometown of Lynn where he was a dedicated lifelong member and Treasurer of Friends of Lynn Woods. Proud of his city's sports, Chris religiously watched the Red Sox and Patriots, taking up his free time. Chris devoted the past 23 years of his life to help raise Tobin, the grandson of his good friend, Marge. Tobin was the joy of Chris' life and they shared a tremendous relationship, spending most of their time together. When diagnosed with cancer last May, Chris' only concern was to see to it that he made the trip to Tobin's graduation from Bennington College that June, confidently against the doctor's orders not to travel. We will greatly miss Chris Joyce, a loss much too early. He was treasured by many who knew him, his generosity, and caring…he will be cherished forever.